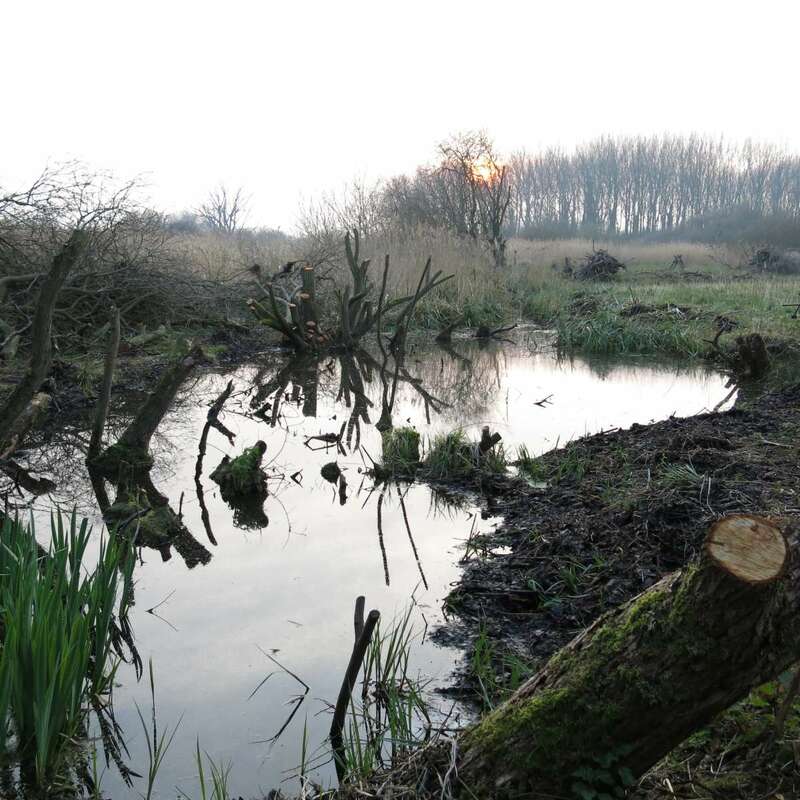 I originally created my Blackwater Blog to report on progress at the five-acre site we own on the banks of the Yare in the Norfolk parish of Postwick, just east of Norwich. Perhaps it is the lack of a sense of real progress – two steps forward, one step back has been the order of things for two years – that I haven’t really got going on this enterprise. But this morning I am taking the plunge. The site is a glorious mix of typical Broads carr/fen habitats with 600m of freshwater dykes, a larger extensive pond area, thickets of sallow mingled with alder and a single jay-sown centurion oak. One is always drawn to report the most exciting and rarest sightings such as the cranes that flew over last weekend or the red kite sailing past earlier this month, but the things i love most at the moment are the millions of spiders (lycosid wolf spiders) that trot away in their hundreds with every single footstep you take, and then the burbling sweet chorus of singing chiffchaffs, reed, willow and garden warblers, blackcap and whitethroats. And last week my first cuckoo. It is heaven and to think it is ours!. It’s divided into two fields that I call Sallow and Oak Fen and most of my work has been concentrated on the south dyke in the latter. 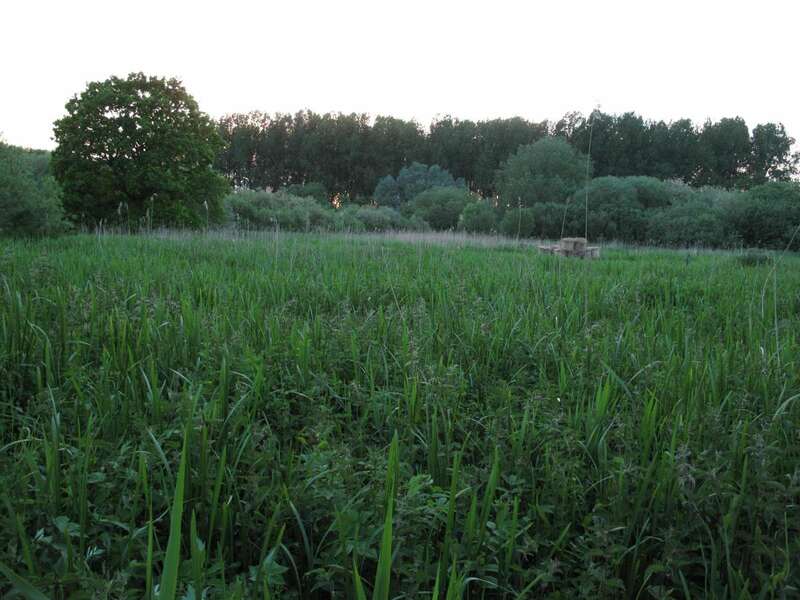 Here’s Oak Fen photographed on one balmy June evening when we were having a picnic. The artist Kurt Jackson recently came and painted it and I can’t wait to see his new book (http://www.kurtjackson.com/News-Page.html) and his interpretations of this wonderful tree, which is presently home to thousands of gall-creating cynipid wasps and a fabulous little micro-moth Black bordered-Piercer whose discovery is in my next blog coming very soon. While we bought it in 2012 Blackwater had probably had no work or management of any kind for 30 years. 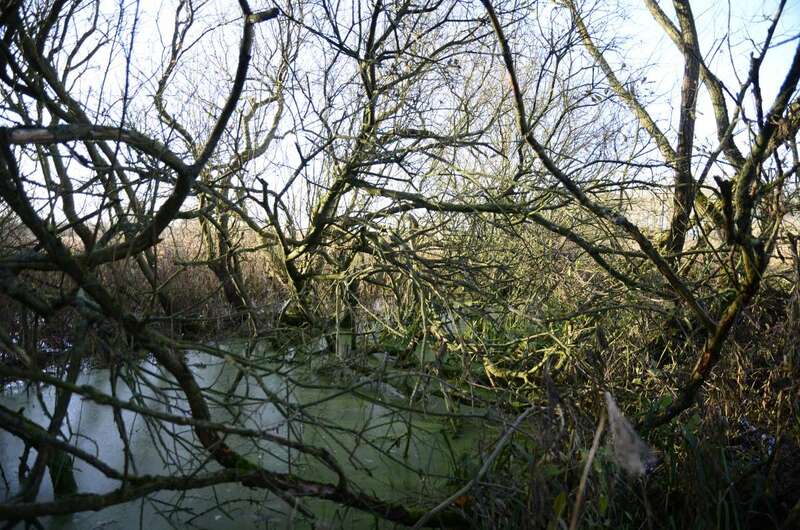 The neglect has been particularly emphasised in the dykes, because they have become completely overshadowed and overgrown with sallow thickets. The effect of this has been to turn what should be clear freshwater into a turbid dark leaf-filled sludge. 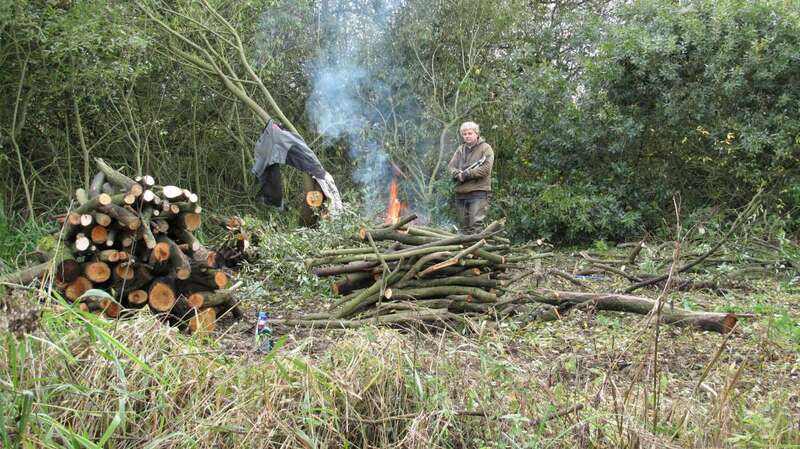 Tackling 600m of dyke armed only with a chainsaw and a chrome has been no simple easy task. Here i am below operating my ancient chrome, bought for me by my friend John Snape. A chrome is an implement typical of Broadland husbandry that looks rather like a pitch fork with curving claw-like tines. It’s brilliant for hauling out sludge. The problem is the volume of that sludge and then what to do with it? My long-term goal is to cut the sallow from immediately adjacent to the dyke and migrate the thickets off those edges so that theoretically I could operate a mechanical dyke digger along the length of all 600m. For now i am doing it manually and what work it is. Greater and Lesser Pond Sedge and Common Reed clumps would slowly take over (above I am tackling sedge) and fill the dyke completely. A single clump can weigh anything up to 15-20kg with its massive root boll lodged on the dyke bottom and heavy with waterlogged sludge and leaflitter. As these monster clumps are hauled out in a kind of tug-of-war (i’m always at risk of losing the game and falling in the water!) the dyke itself likes to belch vast glooping exhalations of hydrogen sulphide all over the labouring human. It’s stinky work as well as hard graft. If that were all, it would be fine. But first you have to find your dyke. For a whole year, aided by one or two friends including my buddy David Tipling (owner of the adjacent patch) John Snape and Asa Hardy-Brownlie, I have cut several tonnes of sallow thicket. The patch on south dyke extended for about 30-40 m and involved about 6 months’ hard labour, weekend after weekend, just to free up the dyke of dense growth. Here is Mr T taking a break while we pondered the hardships of freelance existence. 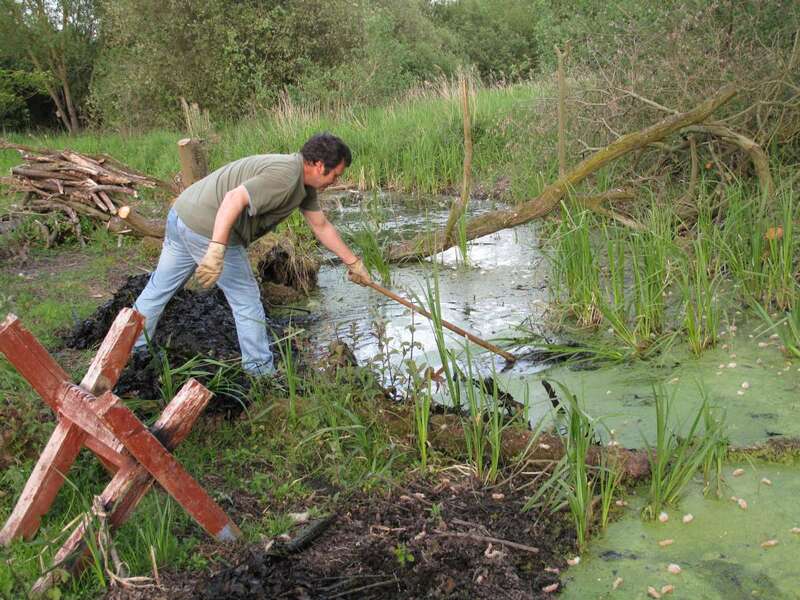 Cutting is especially difficult when the sallows have sunk their roots deep into the dyke water itself. How to operate a chainsaw in these precarious places? It is very slow work indeed. But finally I have reached a kind of milestone. Here’s what south dyke looked like in January and then here it is this April after a lot of hard work. Still some way to go. The before and after images are mirrored by my records of the first freshwater invertebrates ever this month – pond skaters and backswimmers, those weird predatory bugs that scull underwater like tiny oarsmen, have at last appeared in the lifeless waters. It is confirmation that i am doing the right thing. I also released several thousand eyespots of frogspawn ( as told in the Guardian at http://www.theguardian.com/environment/2014/mar/30/blackwater-carr-norfolk-plague-frogs) and now i am praying that the experiment will pay off with lots of little froglets. 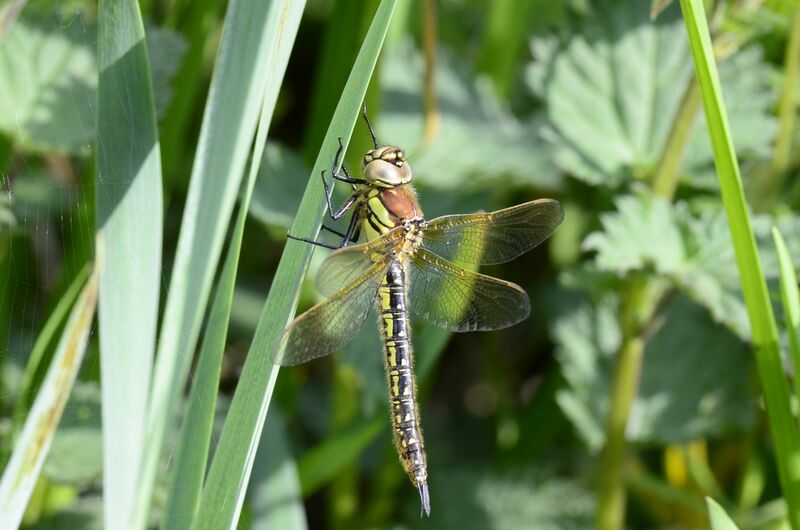 Tomorrow I will report on some of the wildlife already recorded at Blackwater and also the fabulous help I have had from the Hawk and Owl Trust, but for now I leave you with sighting of the week, a beautiful Hairy Dragonfly, my first ever.